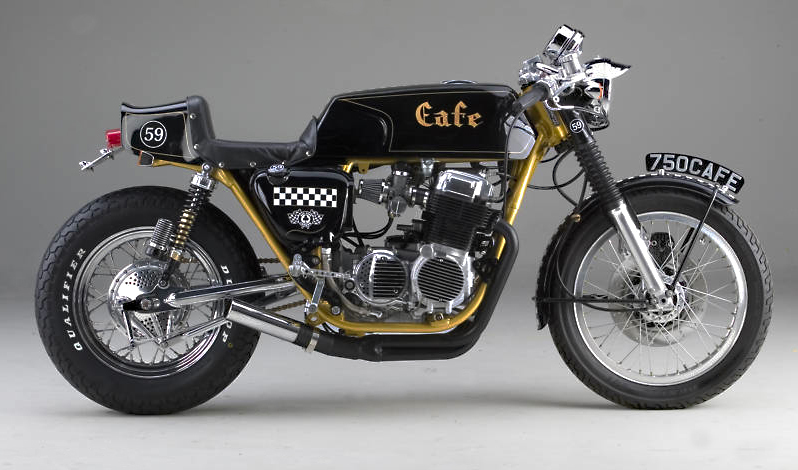 This legendary cafe racer built by Steve ‘Carpy’ Carpenter of Ton-Up fame is for sale on ebay at the moment. This iconic CB750 is being sold as “the worlds most famous cafe racer”, having been featured in over 16 motorcycle magazines and countless websites around the world. Just some of the features listed include “fiberglass tailpiece, borrani style H rim front wheel, race gas tank, individual air filters, 4 into 1 exhaust, chrome swingarm, remote resevoir shocks, lucas style tail light, clubman handlebars, drilled brakes for weight reduction and rearsets for better ground clearance“. We will be watching the auction closely to see how much this rockabilly cafe racer goes for. The bike is being sold on behalf of OldBikeBarn and has a “buy it now” price of $26k. That figure might be a little ambitious, but you never know when Billy Joel or Jay Leno are looking for another motorcycle for their collection. This breathtaking photograph is just one in the series by Los Angeles based photographer Jerry Garns. 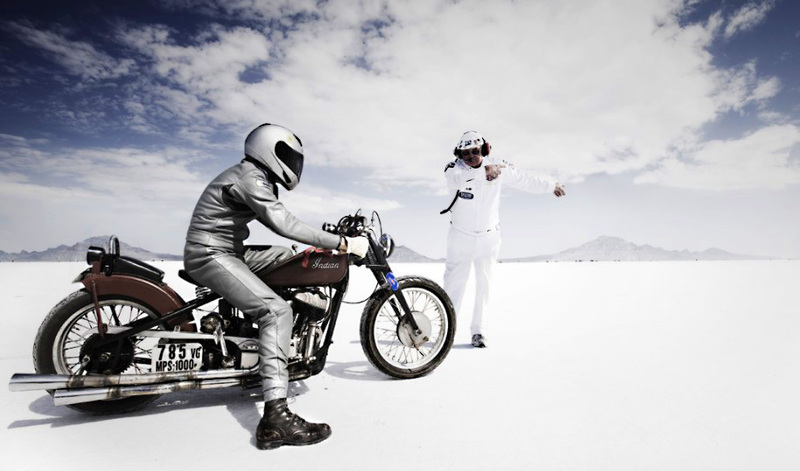 If this shot doesn’t inspire you to head to the 2010 Bonneville Speed Week then nothing will. Jerry tells us that someone once said that “if you are a Buddhist you go to Tibet, but if you are a motorhead, you go to Bonneville”. Jerry had been wanting to go to Bonneville since he was a kid so when he finally arrived last year this is how he described the life long dream: “Once you leave the paved road and roll out onto the salt, you feel like you are in another world. The expanse and flatness, along with the history of racing, creates a sense of place that is beyond written description. Everyone should go to the salt flats at least once in your life to experience it for your self”. To see the other spectacular shots in the series, including legendary Shinya Kimura and Randy Speranza check out Jerry’s portfolio. 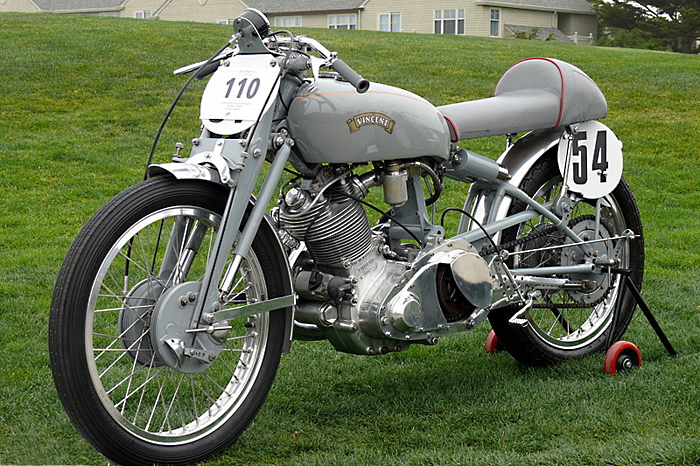 This beautiful Vincent Grey Flash Replica was sold at auction a few years ago for $29,250. Quite a lot of money but when you hear that only 31 were ever built (less if you look at Vincent official records) then an authentic Flash would probably sell for well over $100k. This classic British motorcycle was briefly manufactured between 1949 to 1952 and was advertised as the new racing “thoroughbred from the Vincent stables”. It was based on the Vincent Comet and the 1000cc Black Lightning but was stripped down to 330 lb (149kg) as a 500cc single. Unfortunately most of us will never afford one but we can still dream of finding one in a country barn, just like in the book written by Tom Cotter called ‘The Vincent in the Barn‘. For more specs and a list of every Grey Flash manufactured check out this comprehensive Vincent site. This stunning illustration is by Australian artist Gaston Vanzet. Gaston is completely obsessed with drawing and painting classic motorcycles. Each picture usually takes him around 3 weeks to finish and this is how Gaston describes the experience: “I love painting these motorcycles, I become one with the machine as I end up knowing every detail, every curve and fin, they become mine”. These days he does the painting on his computer using a Wacom tablet – “the technique is nearly the same as the old days of paint and turpentines except there is no mess”. Each stroke is still done by hand except for the backgrounds which are combinations of photographs mostly from his local area. To view all these amazing illustrations visit the gallery at Custom Motorcycle Art, also check out Gaston’s blog to get some history about the artist. It’s hard to believe only 21 of these beautiful Greeves Oulton racers were ever sold. As the story goes the previous race bike they produced was the legendary 1965 250cc Greeves Silverstone which won the Lightweight Manx Grand Prix twice. Then at Silverstone it won third place which cemented the production of the Silverstone through until the end of 1967, until they were being beaten by rice rockets like the Yamaha TD1C. Greeves decided to produce a larger capacity machine for the 1968 season, and thus was born the 344cc 35RFS Oulton. This bike was a lightweight stunner but sadly failed to match the success of the Silverstone, and as mentioned earlier only 21 were sold. Unfortunately Bert Greeves decided it was time to retire from the company in 1968 and after that so did Greeves production of road racers.